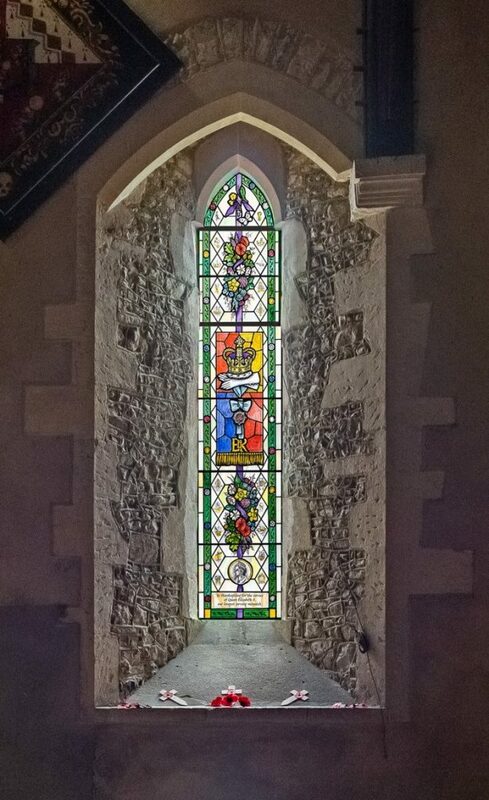 This window is designed to tell stories of the Queen’s reign, and also to harmonise with the Queen Victoria and St Mark windows, while keeping good light levels and a feeling of airiness that is essential for activities in this part of the church. The centre of the window is a banner, echoing the colours of the Royal Coat of Arms. On this sits the crown used at her coronation, resting upon a pair of white gloves; these are a symbol of the Queen’s constant service, as well as a reference to the many, many thousands of hands she has shaken in the performance of her Royal duties. Beneath is a sash with the star badge of the Order of the Garter. The brocade patterns in the cloth of the banner represent plants and flowers from the Commonwealth. A purple ribbon descends from the apex of the window to the base, representing the continuity of the royal line, joined in a knot at the top where King George VI’s reign ends and the Queens begins. Secured in the knot are two items, the first a golden crucifix, a reference to the Queen’s title of Defender of the Faith, but also a quiet symbol of the strong personal faith that has sustained and guided her. The second is a primrose, a favourite of the Queen’s that is especially grown for her in her gardens. A traditional symbol of eternal love, near it is a butterfly, often used to symbolise eternal life and hope. The purple ribbon binds bouquets of flowers and plants symbolising the United Kingdom, and includes poppies in remembrance of those who served their country, commemorated by the Queen every year. Echoing the detailed paint and stain work in the Queen Victoria and St Mark windows, two columns of grisaille (the traditional shading of grey) and silver stained diamonds are included, depicting images of notable events and achievements during the Queen’s reign, listed below. An image of the Queen appears in a roundel above the inscription at the base which reads ‘In thanksgiving for the service of Queen Elizabeth II our longest serving monarch’. A border of rich greens frames the window, this colour representing the British Isles. This is decorated with a pattern of olive branches and wheat, a reference to the embroidered border of the Queen’s Robe of Estate, worn after her coronation. The plants symbolise peace and plenty. This border is studded with roundels, representations of silver, rubies, gold, diamonds and sapphires for the Queen’s Jubilees. Handmade glass will be used throughout, with glass painting and silver stain, traditionally leaded and cemented.